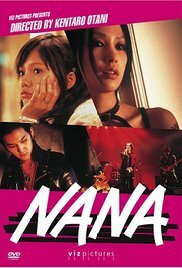 Based on events in the manga by Ai Yazawa, Nana is about the adventures of two girls, who are both named Nana. Although their names are the same, their lives are completely different. One of them is an ambitious punk who is looking to break into the world of rock and roll, while the other simply wants to have a new life with her boyfriend. After moving to Tokyo while chasing their hopes and dreams, their lives greatly change after meeting each other. Read more on Wikipedia.